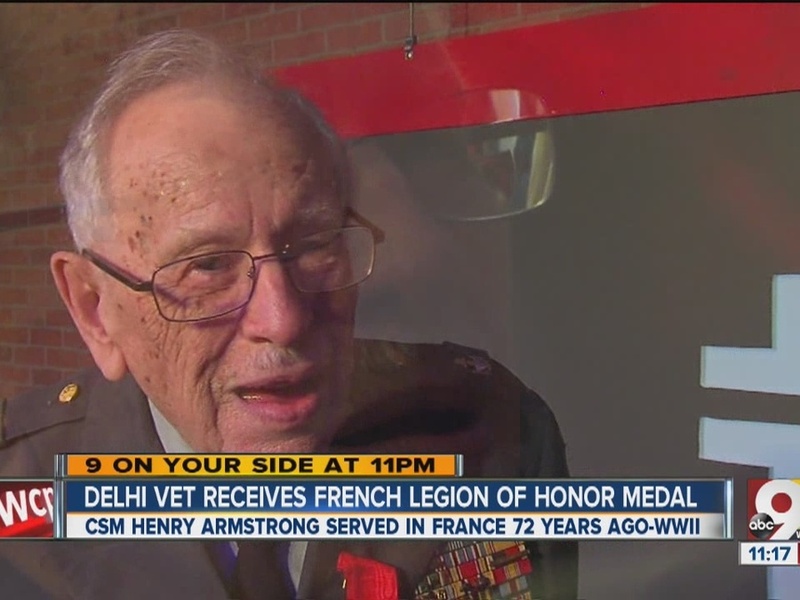 DELHI TWP., Ohio –Seventy-two years after D-Day, France said thank you Saturday to a 91-year-old Delhi man who helped liberate that country. In a stirring ceremony, the French consul from Chicago pinned the French Legion of Honor medal on Command Sergeant Major Henry Armstrong inside Grace Covenant Church. Armstrong's uniform already had so many ribbons you might have thought he was a general. "Every French person has a special place in their heart for you," the consul said, and the crowd of family, friends and dignitaries – including Cincinnati Mayor John Cranley and other local and state officials – rose to their feet in applause. "This is one of the greatest honors of my life," said Armstrong. Armstrong, still spry, recalled a lot of his experiences as an 18- and 19-year-old in World War II – fighting the Germans in France and Germany and liberating a concentration camp in Austria. "It would be wrong to say that I wasn't frightened because it's a horrid experience to realize that, No. 1, someone is shooting at you, and No. 2, you have to shoot back," he said. Armstrong remembers well his first night in France on a guard detail. "Every one of us in the detail killed a tree. There was a tree that looked like a human being on the opposite of where we were, and I think everybody there shot that tree that night," he said with a laugh. Some of his memories brought more laughter; others brought pause. "The saddest part was the concentration camp of course," Armstrong said. "We found a pile of rags that contained the bodies of women and children that had been machine gunned. And I often wonder about the guy behind the machine gun - how he felt about that." The Legion of Honor is only given to American veterans who served in France during WWII. Armstrong served eight engagements in France and 10 in Germany, according to his bio. He enlisted in the Army before he graduated from Holmes High School in Covington. He returned to Northern Kentucky in 1946, graduated from high school and later re-enlisted to serve 41 years in the military. Armstrong has been married to his wife, Patricia, for 57 years. The two have six children together, as well as 12 grandchildren, 27 great grandchildren and one great great grandchild. Armstrong was a founding member of the Delhi Township Veterans Association and is still serving, supporting fellow vets and talking at schools. Delhi Township Trustees Cheryl Sieve and Rose Stertz, Hamilton County Commissioner Todd Portune, State Rep. Lou Terhar and State Sen. Bill Seitz also attended the ceremony.